Denis Shapovalov is doing things he didn’t think were realistic at the beginning of the season. After his semifinal run at the Rogers Cup, the Canadian teenager skyrocketed from 143rd to 67th in the ATP World Tour rankings — easily exceeding his goal to be in the top 150 by season’s end. Denis Shapovalov is doing things he didn't think were realistic at the beginning of the season. After his semifinal run at the Rogers Cup this month, the Canadian teenager skyrocketed from 143rd to 67th in the ATP World Tour rankings — easily exceeding his goal to be in the top 150 by season's end. But the Richmond Hill, Ont., resident isn't getting too far ahead of himself before U.S. Open qualifications, which begin on Tuesday. He knows there's still a lot of work to do. "I come from a very humble family. My parents worked extremely hard to get where they are in their life. 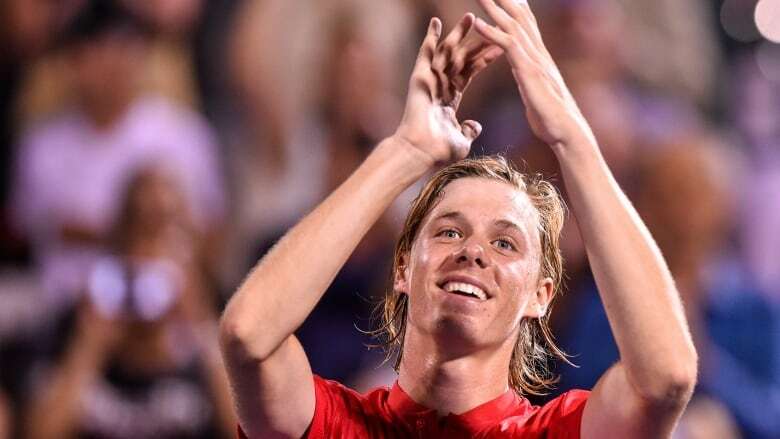 So I'm very fortunate to have two good parents that keep me in line," Shapovalov said during a conference call last Thursday. "That's how I was brought up and that's how I try to be every day." Patience is something veterans on both the men's and women's tours say is needed for developing junior stars. Elina Svitolina won the 2010 junior French Open and is now ranked No. 4 in the world among women. "When you're young, you want results right away," the 22-year-old said while in Toronto for the Rogers Cup. "If you trained hard last night, you expect that you'll play unbelievable [the next day]. "You need to lose matches because it's going to help you in the future to understand what you need to work on, what you need to improve — maybe mentally or physically." Shapovalov knows he needs to become more fit in order to handle the wear and tear of a full pro season. But implementing workout plans in between tournaments is a work in progress with his team. "I'm going to be playing a lot more top guys so the tennis is going to be a lot more physical," he said. "The off-season is going to be a very big part of [building] that [strength] because I have to compete with guys like Rafa [Nadal] or Novak [Djokovic] three out of five sets at the Grand Slams. "We've been working extremely hard and when we have those ... breaks [between tournaments] we make sure to really focus on my physical part [of training] just as much as the tennis part." Svitolina says that because the bodies of many young players aren't completely developed, they usually lack the strength needed to stay healthy and perform consistently well. "They can play very well just [for a] couple of matches or a few tournaments but then they break down a little bit," Svitolina said. But there's a fine line in between training hard and overtraining. Former world No.1, Caroline Wozniacki remembers pushing herself in the gym until she'd almost break down. At the time she thought feeling completely exhausted meant a solid day of training. But after 12 years on the tour, the Danish star realized she needed to listen to her body more. "Sometimes your body needs recovery and in the past I was like, 'Oh no, I'm fine I don't need to recover. I can keep going,'" Wozniacki said. "When I was young, I could keep recovering and I would never have a massage after a match and it was all fine." Shapovalov knows he is still developing physically, but the 18-year-old believes that on any given day he can compete with the best of them. "I competed with [Alexander] Zverev. That gives confidence for myself to believe that I do belong on the court with these [top-ranked] guys and I can compete with them," Shapovalov said. The young Canadian said each match at the Rogers Cup brought out the fighting spirit within him. Whether it was saving four match points in his first-round match against Rogerio Dutra Silva or coming back from a 3-0 deficit in the third set tiebreak against Rafael Nadal, Shapovalov discovered he could respond when his back was against the wall. "Every day, I was learning something new about my game. I was learning how much I can handle fighting-wise, just competing for every point," Shapovalov said. He's also been using the slice shot more effectively, a tactic Shapovalov's coach, Martin Laurendeau, said helps the teen slow down the pace of the game and force opponents who are uncomfortable at the net to come forward. The net also happens to be a point of emphasis for the Shapovalov as he admits needing to clean up his volleys after missing quite a few during the one-week tournament in Montreal. If there's one thing that impresses Laurendeau the most about Shapovalov, it's his ability to immediately implement what he's worked on in practice. "If he buys the concept and it makes sense to him, he does it," Laurendeau said. "As a coach, that's just a gift from the heavens because you can work on stuff and know that he's going to take that and run with it, which accelerates the learning curve and one of the reasons why he's learning so fast."